We pride ourselves in staying humble and retaining our focus on providing unsurpassed support and service to our customers. You might be shocked to find out that when customers call our 800 toll free line for support they are speaking directly to the female owner of the company, Terri Gelman. She retains this role because we believe so highly in the absolute necessity and foundation of happy satisfied customers as part of our success formula. We source our products from small workshops in rural areas on the island of Java in Indonesia. Over the last six years, as we have grown, so have our suppliers. This has provided important opportunities for local villagers. We have also been pleased as we have been able to help local entrepreneurs achieve their own dreams and goals through the cooperation with our company over the years. We have worked very closely with our manufacturing partners over the years to increase their level of quality to exceed the expectations of our customers. This has been a long and rewarding journey. Our General Manager, Jeff Moore who is the brother of the owner, at times has spent up to four months of the year in Indonesia working on the ground floor with our manufacturers. Our quality initiative has been supported with a dedicated staff of local quality inspectors who tirelessly crisscross Java working with our suppliers at every stage of the manufacturing process. We are involved in every step of the manufacturing process from lumber sourcing, cutting, kiln dry, carpentry, fine finishing, and surface coating. As part of the goals of sustainability we do not alter the woods natural look and quality with any chemical treatments. One of our pioneering innovations has been the EcoDecors® product line that accentuates the natural beauty of teakwood, complete with color variations and strong wood grains. We are proud to have been selected by a jury to be showcased within the American Association of Interior Designers’ Impact of Design Showcase in 2018. Suppliers were selected to be featured that met the criteria of positively impacting human health and wellness through innovative designs, while practicing environmental sustainability. Positively impacting lives has been at the core of our mission since our inception. We pride ourselves in being market leaders in the teak bathroom furniture market with first to market innovative designs, finishes and features. Our innovations in teak shower stools have resulted in numerous design patents. We are constantly continuing to innovate to stay ahead of those that follow us. However our greatest sense of accomplishment is from reading and hearing the stories of gratitude from our customers telling us how our pioneering LiftAide®shower benches helped themselves or a loved one transition from the hospital to the house after a surgery. 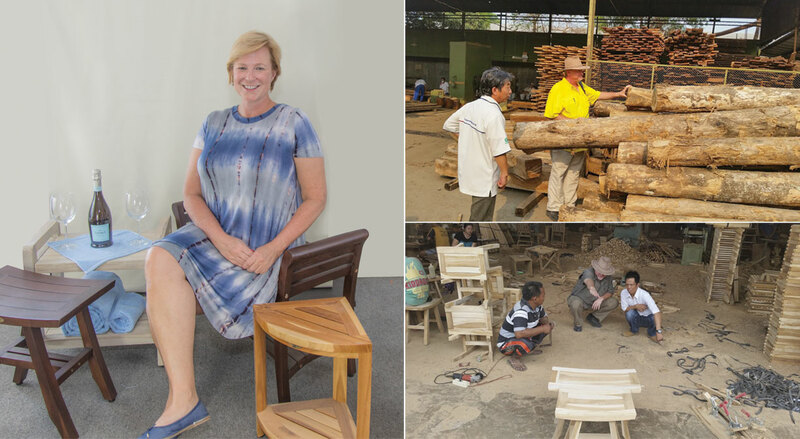 This allows us to feel pride that our entire global team involved in bringing leading edge new teak furniture products to market has accomplished our goal in establishing this business.